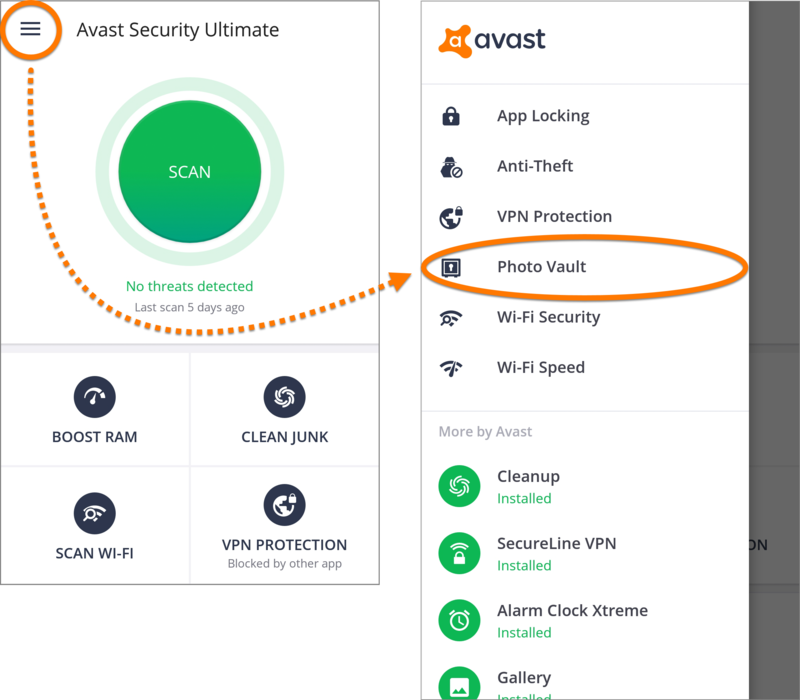 Avast Mobile Security is a security app for Android designed to protect your device against unwanted phishing, malware, spyware, and malicious viruses such as trojans. The app also provides a range of features to make using your device easier. 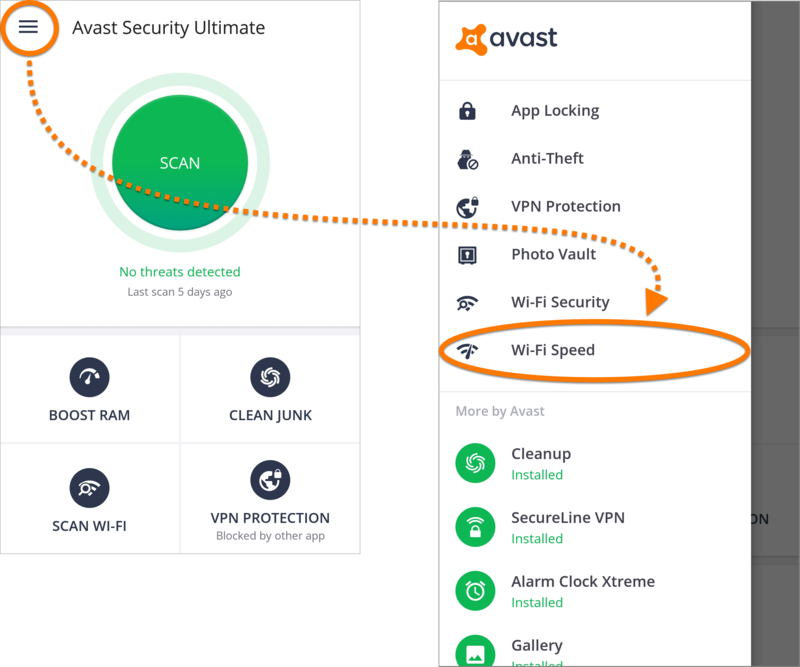 Refer to the sections in this article for instructions on using Avast Mobile Security. 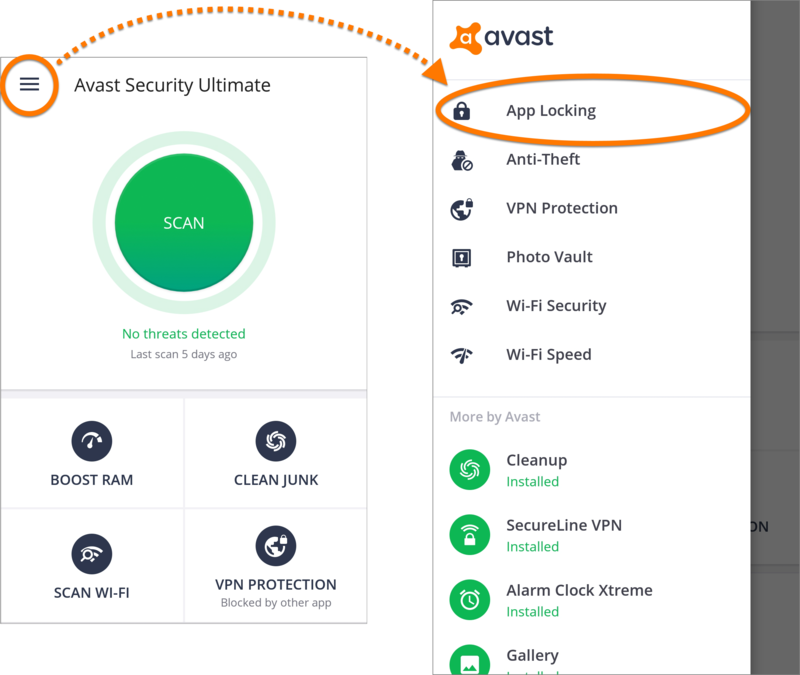 Click the Avast Mobile Security icon on the main screen of your device to open the app. The main screen comprises of the Scan button and four tiles representing the other scan options. 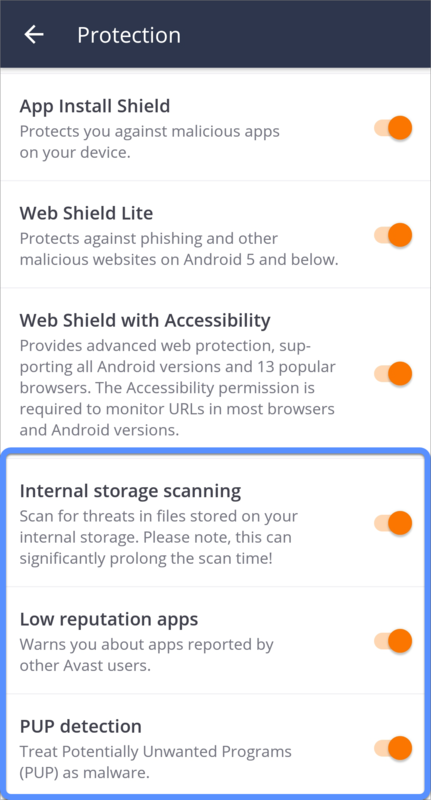 Scan: scans all installed applications and informs you of security risks caused by changes to default Android settings. Boost RAM: kills apps running in the background and slowing down your device. Clean junk: displays the current amount of storage space being used on your device and enables you to safely free space. 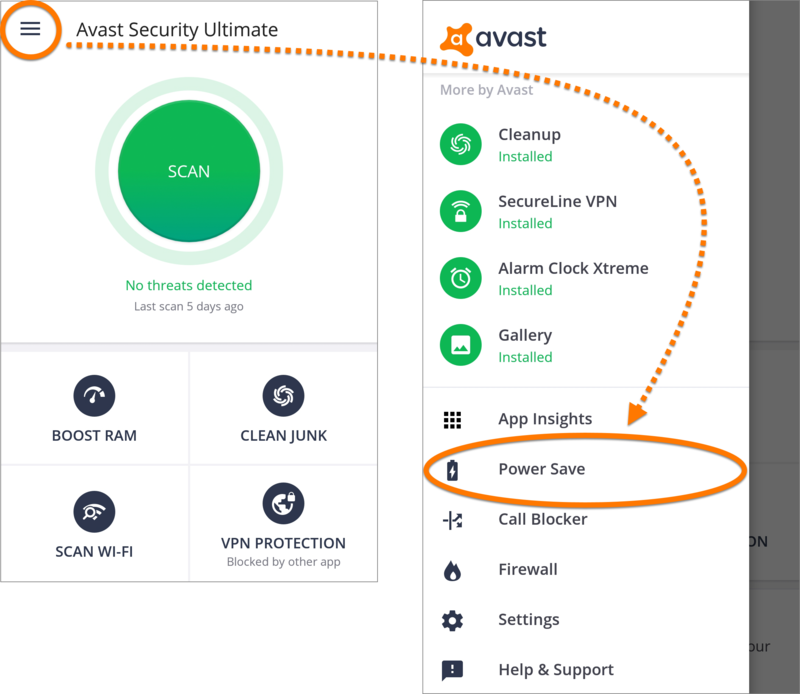 You are also prompted to free up even more space with the Avast Cleanup app. 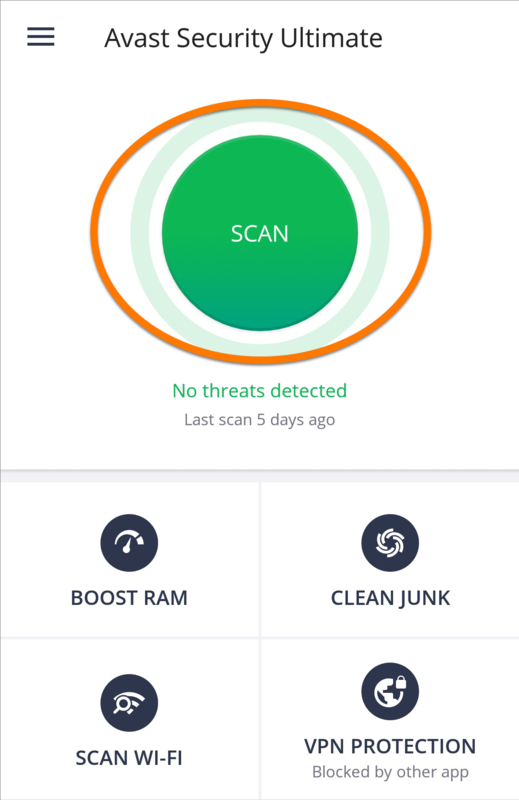 Scan Wi-Fi: enables you to scan your network for problems with the router, encryption, Wi-Fi, and connection. This option appears as Check Speed once the security of the current Wi-Fi network has been verified. VPN Protection: allows you to connect to the internet via secure Avast VPN servers, using an encrypted tunnel to protect your online activity from eavesdropping. This feature is available only in an Ultimate or Ultimate Multi subscription. 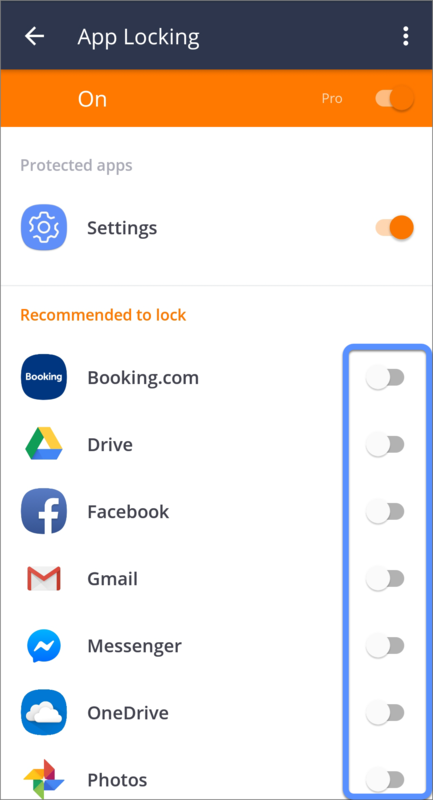 From the main screen of the app, you can also tap ☰ Menu (three lines) in the top-left corner to access a range of privacy protection and device management tools and configure the app Settings. Lock an unlimited number of apps with the App Locking feature. 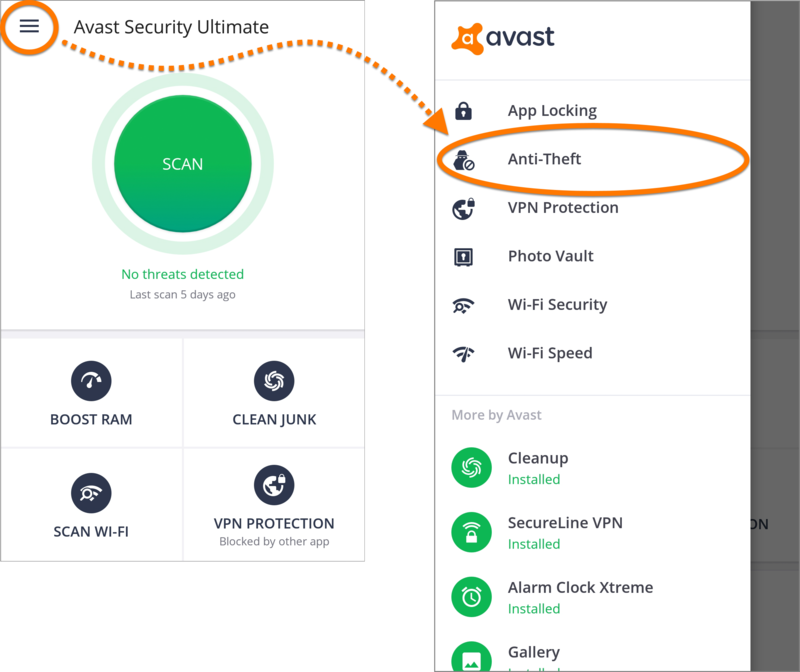 Use Avast Anti-Theft to capture a photo of the thief when an incorrect PIN is entered, lock your device when the SIM card is changed and secretly record the phone's surroundings at any time. Ensures prioritized responses to your support inquiries. 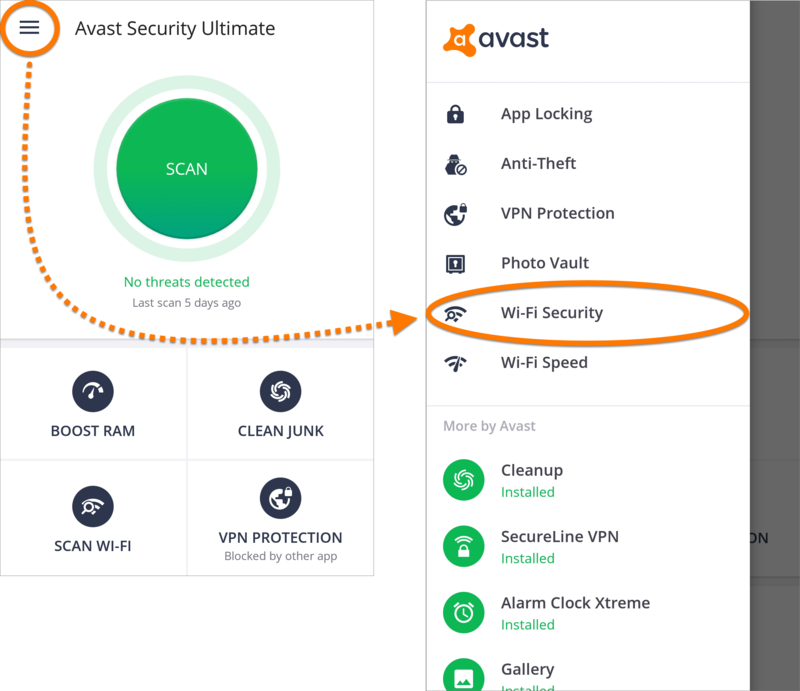 Avast Mobile Security enables you to scan your installed apps and memory card contents for security issues, and also detects security risks caused by changes to default Android settings. Tap Resolve to address any security issues found on your device. When the scan is complete, Scan reports any found issues. If no issues are found, Scan provides you with tips for further optimizing your device. Tap ☰ Menu (three lines) and go to Settings. 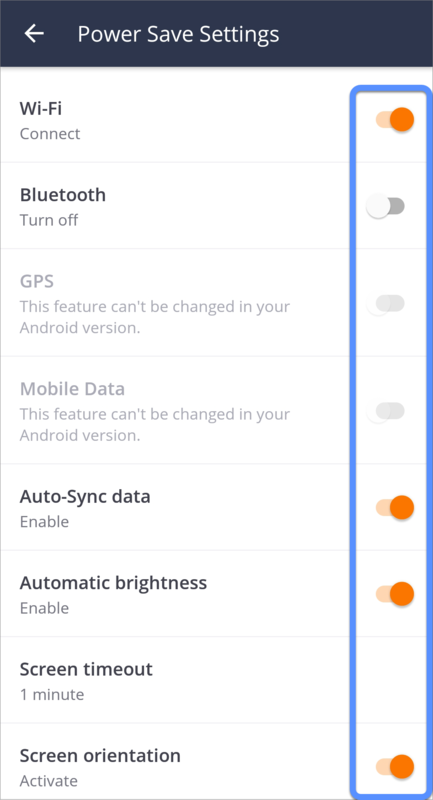 Tap Protection to open a list of protection settings. Tap Scheduled scan to set regular scans. 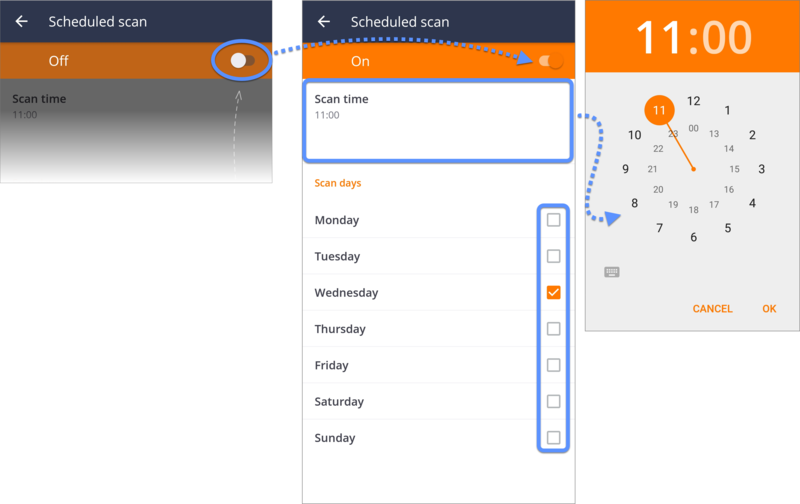 Tap the OFF slider at the top of the screen so it changes to ON, and select the time and day(s) of the week when you want the regular scan to run. 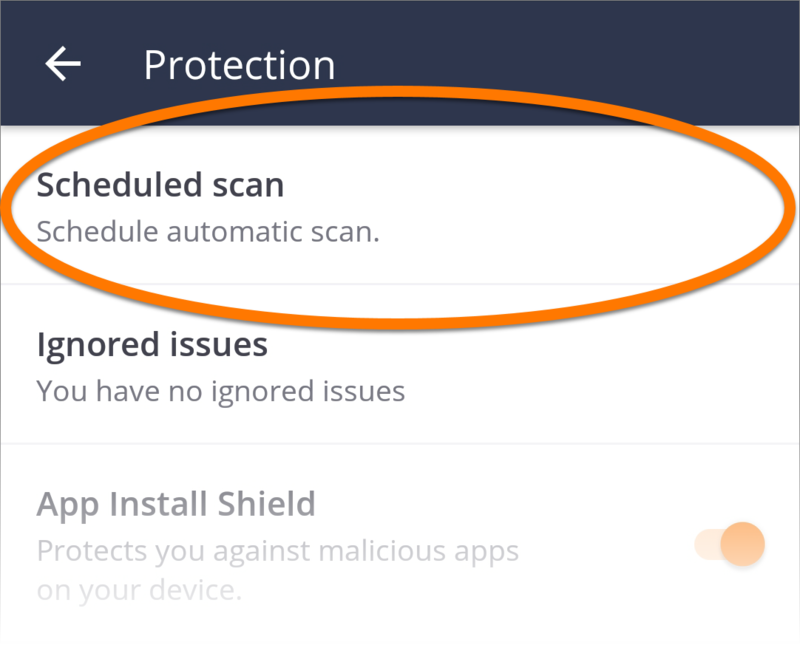 Tap the back arrow to confirm your scheduled scan settings and return to your protection settings. 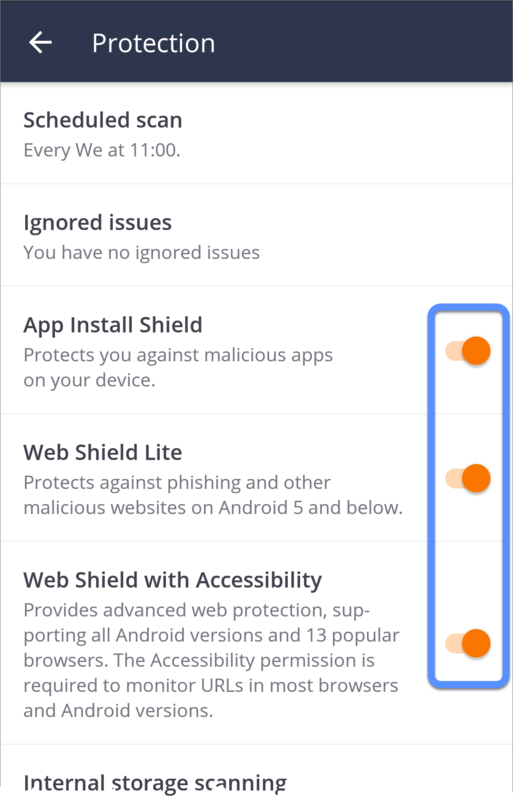 To access your protection settings, tap ☰ Menu (three lines) in the top-left corner of the main app interface and select Settings ▸ Protection. App Install Shield: scans apps after installation. Web Shield Lite: prevents you from accessing fake sites online on Android 5 and below. 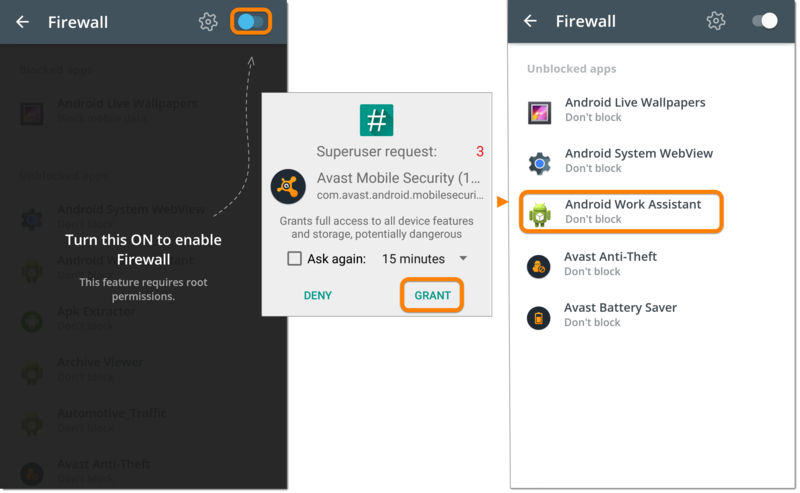 Web Shield with Accessibility: before enabling this shield, you are prompted to grant Avast Mobile Security the Accessibility permission. This is necessary for the app to monitor URLs on Android versions 6 and higher. To ensure maximum protection, all shields are enabled by default. 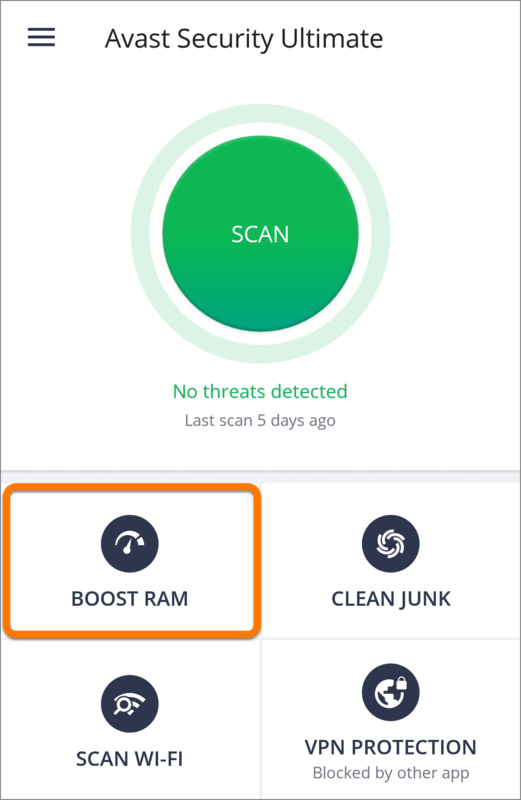 Internal storage scanning: enables the app to scan your device's internal storage, including your photos, media files, and installed apps, for threats. This option is disabled by default. Low reputation apps: enables the app to detect and warn you about apps that have a low reputation. 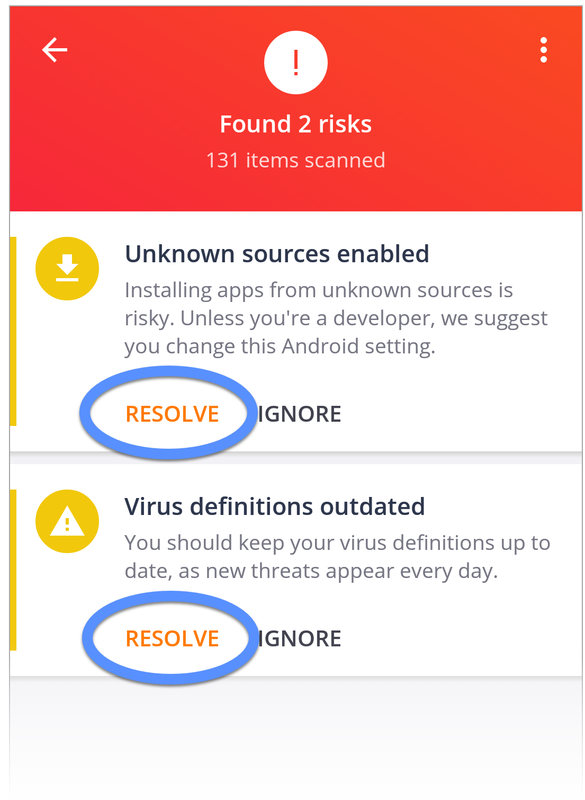 The reputation of an app is determined by feedback from Avast users. PUP detection: enables the app to protect you from Potentially Unwanted Programs (PUPs). These are programs that are stealthily downloaded when you download other programs. PUPs usually clutter your device with unwanted activity, such as toolbars and ads that interrupt you while browsing online. Tap the back arrow to exit your Protection settings. 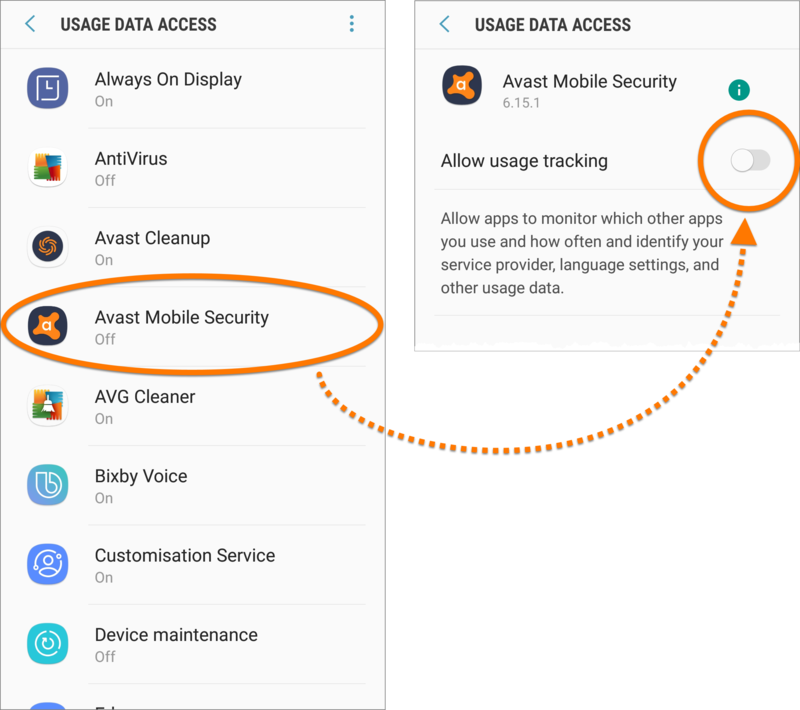 The Boost RAM option allows Avast Mobile Security to kill apps running in the background to prevent these apps from slowing down your device and draining the battery. Tap the Boost RAM tile to kill apps running in the background. The Clean junk tile displays the current amount of used storage space on your device and allows you to free up space with the Safe Clean option. Tap the Clean junk tile. 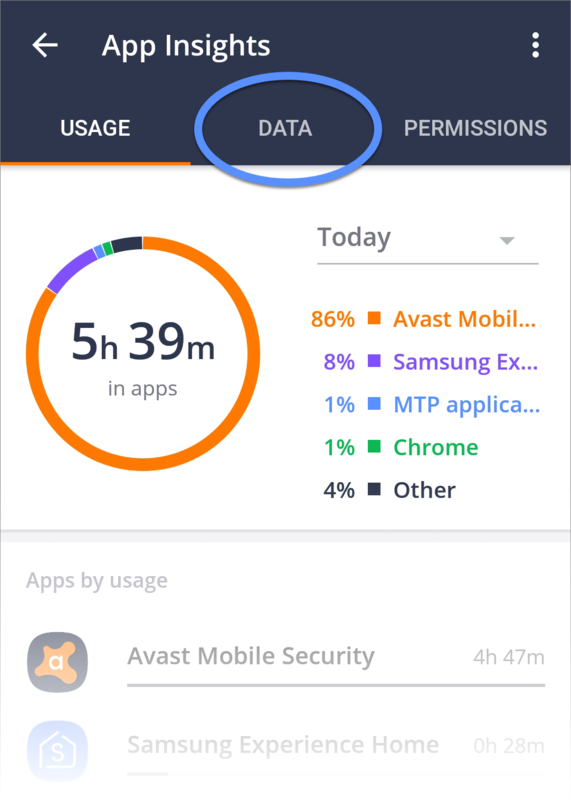 Select Avast Mobile Security and tap the OFF slider so it changes to ON to allow Avast Mobile Security Usage Data Access. 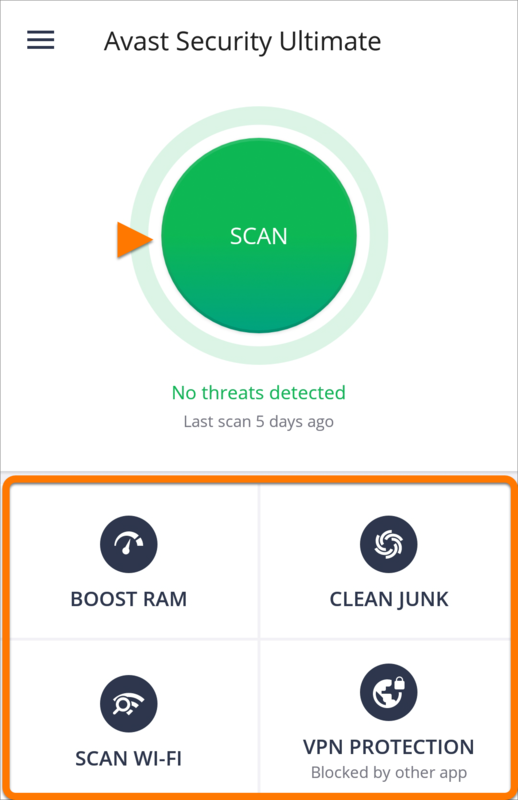 From the results screen, tap Clean under Safe Clean to safely remove unnecessary files from your device. You can additionally tap the down arrow in the Safe Clean tile to select or deselect specific item types for cleaning. 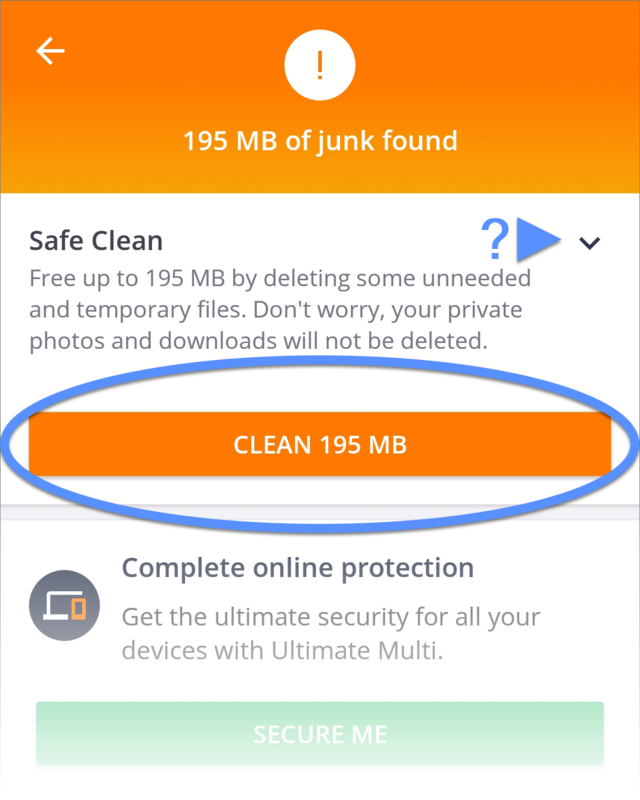 With the Avast Cleanup app, you can remove more unnecessary files, media, apps, and app data to free up more storage space on your device. You can also transfer files and media to a cloud storage service. 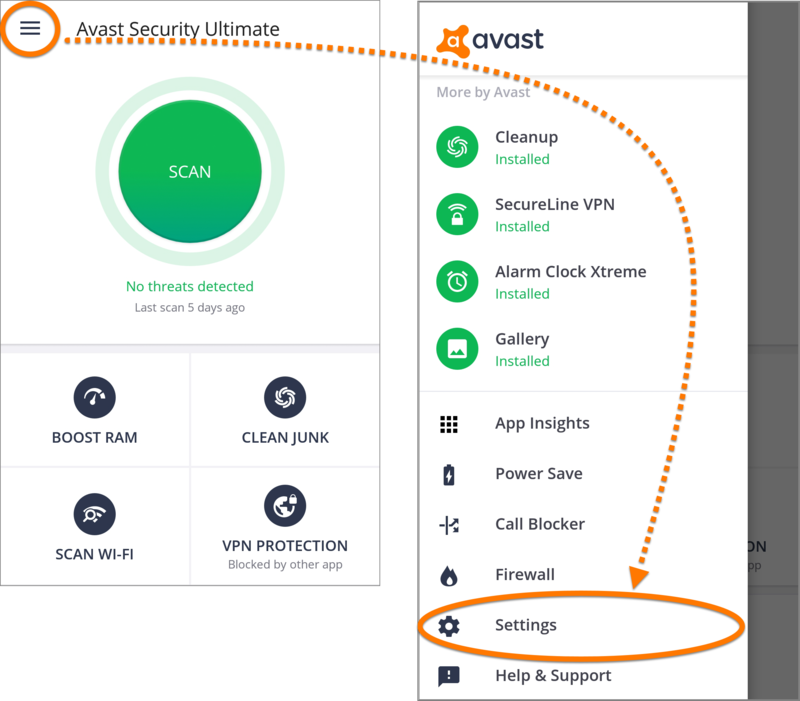 If Avast Cleanup is not already installed on your device, select Clean More under Deep Clean and follow the on-screen instructions to install the app. To test the speed of your Wi-Fi network, go to ☰ Menu ▸ Wi-Fi Speed. 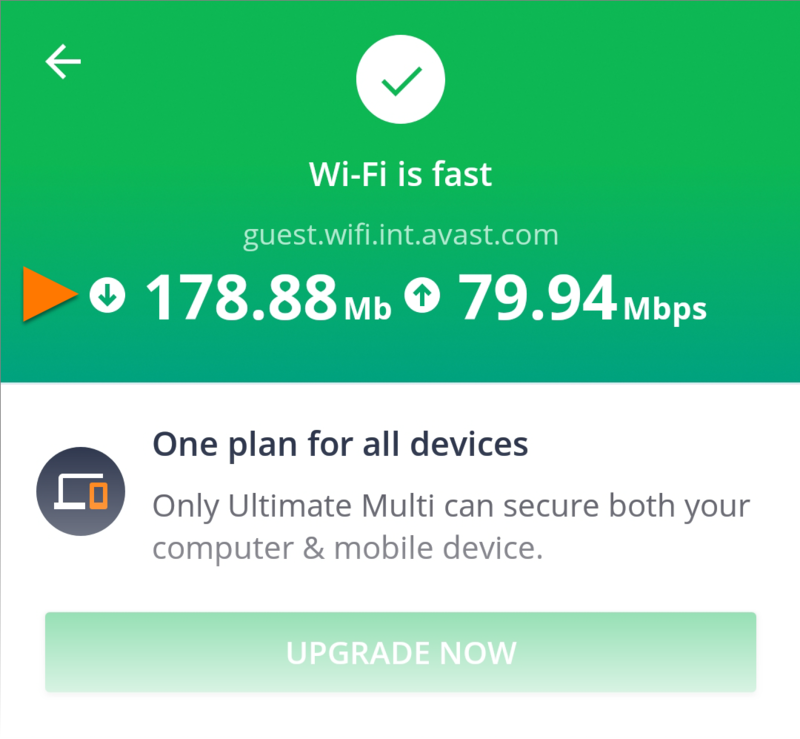 The app shows you the Download and Upload speed of the connected Wi-Fi network. Tap the back arrow to close the results dialog. App Locking is a paid feature that enables you to set a PIN for your apps. Each time you want to open a protected app, you are required to provide the PIN. Tap ☰ Menu (three lines) ▸ App Locking to access this feature. Tap Set Up Now in the bottom-right corner. Tap each of the numbered panels and follow the on-screen instructions to complete each step. You can tap Activate App Locking to start using this feature once all Required steps are complete. Tap the gray OFF slider so it turns orange ON next to the apps that you want to protect. To change your PIN at any time, go to ☰ Menu (three lines) ▸ Settings ▸ PIN & Pattern ▸ Change PIN. Anti-Theft is a feature designed to protect your private mobile data and help you recover your phone in case of loss or theft. Tap ☰ Menu (three lines) ▸ Anti-Theft to access this feature. Wi-Fi Security enables you to scan your network for problems with the router, encryption, Wi-Fi, and connection. Tap ☰ Menu (three lines) ▸ Wi-Fi Security to test the security of your Wi-Fi network. When this action is complete, the app advises if the network is safe and notifies you of potential threats. Photo Vault allows you to protect your photos with a PIN. After moving photos to the Vault, they are encrypted and hidden. Tap ☰ Menu (three lines) ▸ Photo Vault to access this feature. Take new photo: allows you to take a new photo that is added automatically to your Vault. 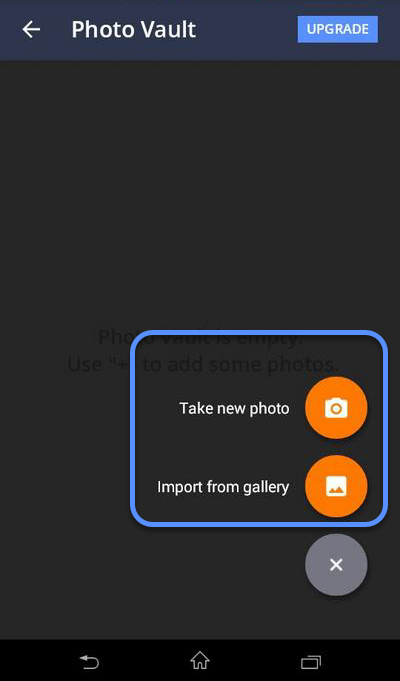 Import from gallery: allows you to select photos from your existing gallery. 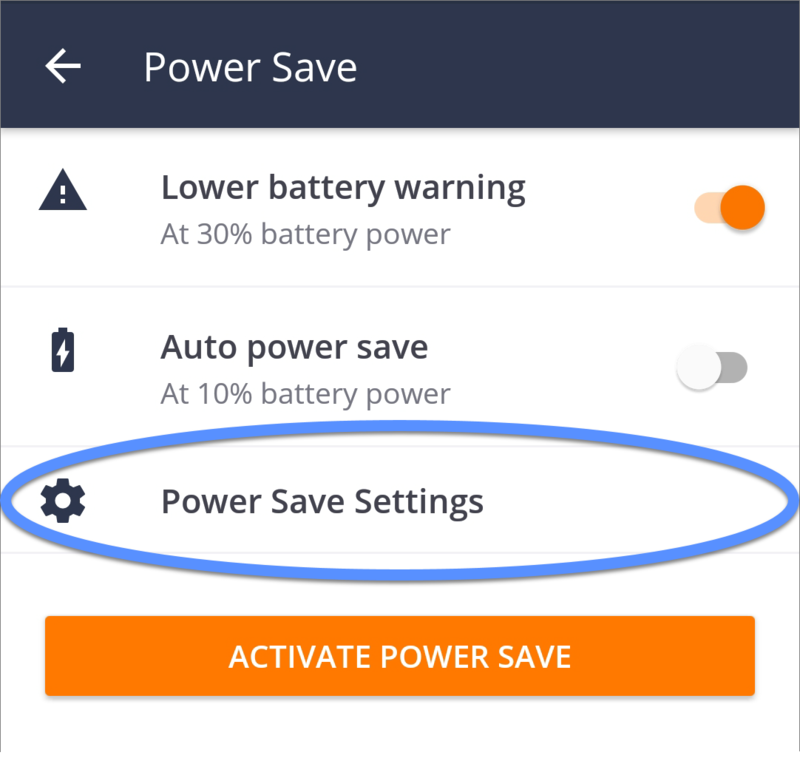 Power Save allows you to adjust a range of settings that may decrease your device's battery consumption. Specify how features that often consume large amounts of battery, such as Wi-Fi, synchronization, and Bluetooth, behave. You can also optimize screen settings for increased battery life. Manually configure personalized battery saving settings, or use the default configuration. 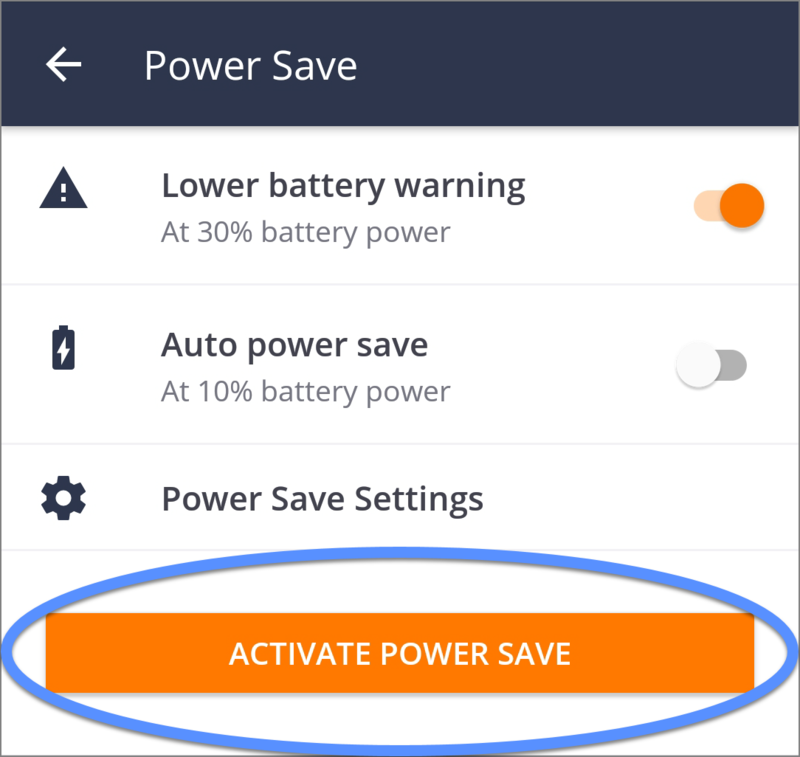 If the Avast Battery Saver app is also installed on your device, manage your power saving options using this app. Tap ☰ Menu (three lines) ▸ Power Save. 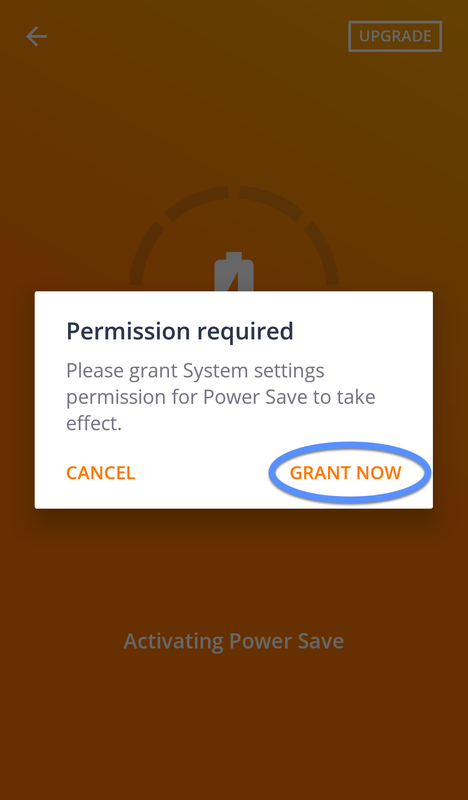 Tap Grant now and grant System settings permission for Avast Mobile Security. Adjust power saving settings according to your preferences by enabling or disabling options visible on the list. Due to recent changes in the Google Play Developer Policy Center and Android policies, the Call Blocker feature will no longer be available in Avast Mobile Security on devices running Android 8 and higher. Tap ☰ Menu (three lines) ▸ Call Blocker. 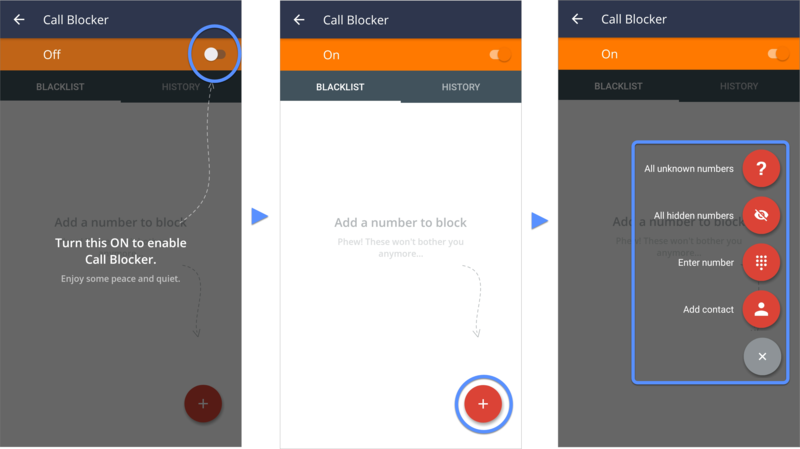 Calls that are blocked by Call Blocker are visible under the History tab on the main screen of Call Blocker. 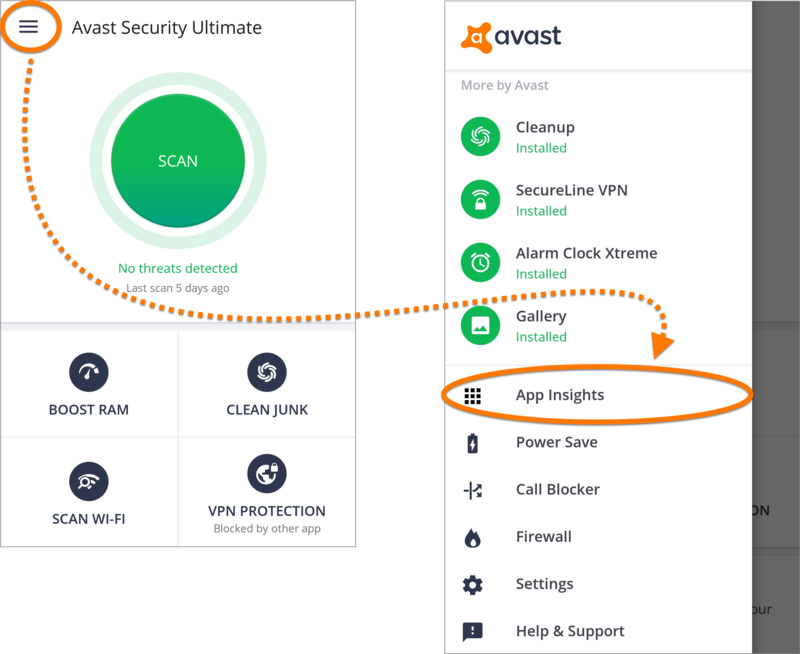 In App Insights, you can set a recommended daily limit for data usage and optionally configure Avast Mobile Security to show alerts that provide information relating to your data usage. Tap ☰ Menu (three lines) and select App Insights. Enter information relating to your data package and your Recommended daily limit appears. Tap Activate. 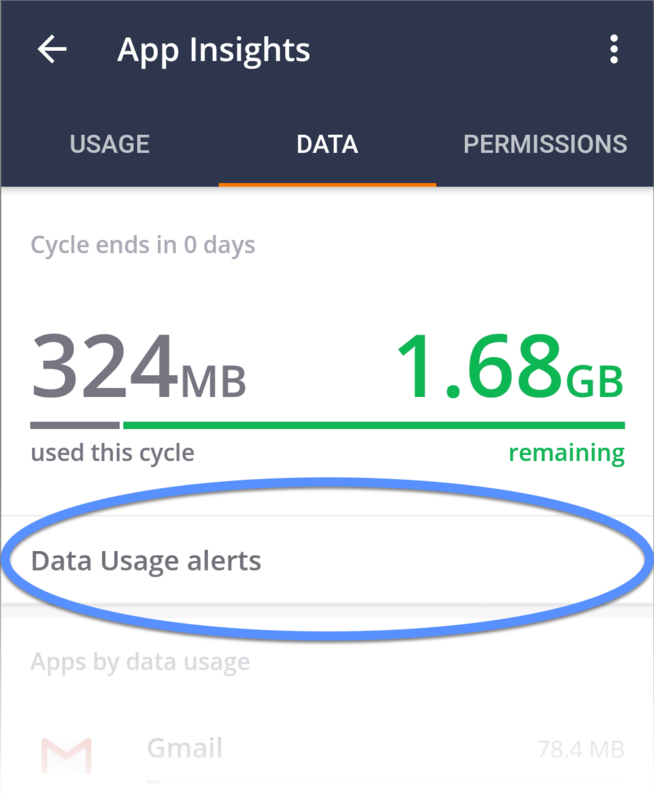 To configure data usage notifications, tap Data Usage alerts. 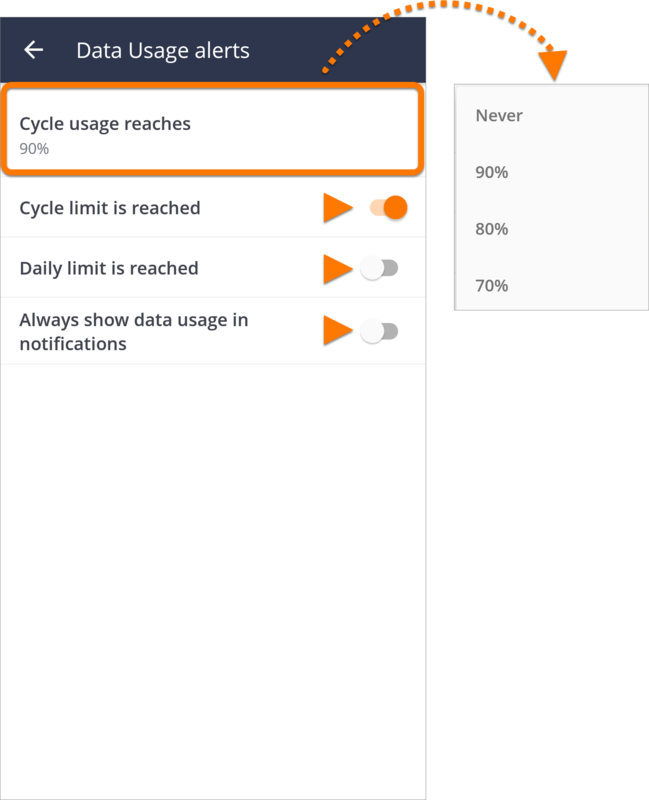 Tap Cycle usage reaches and choose the percentage of used data that triggers a notification. Then, tap the relevant slider so it changes orange ON to enable a notification, or gray OFF to disable a notification. 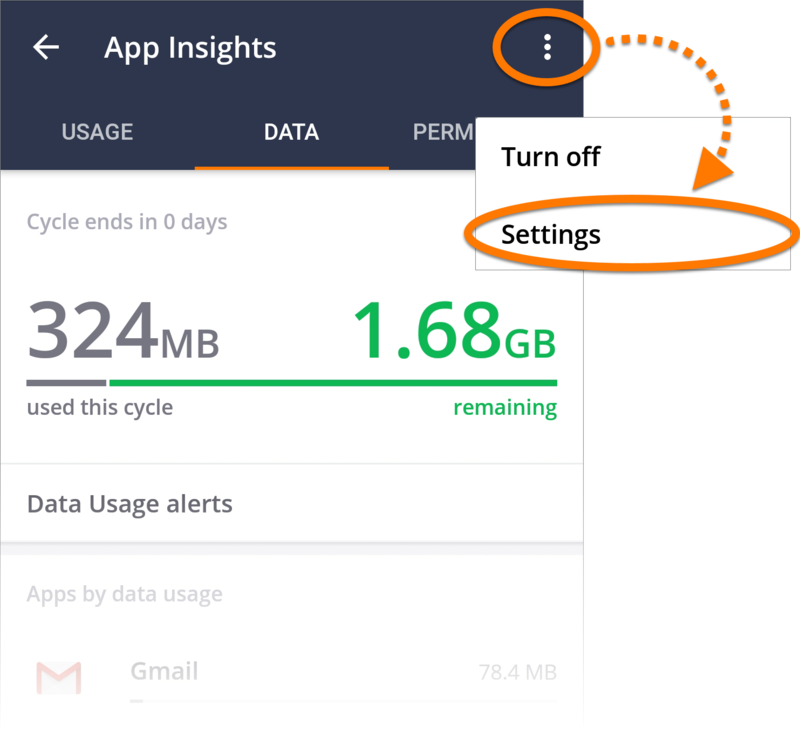 To edit your data package information at any time, tap ⋮ Menu (three dots) in the top-right corner of the App Insights screen and select Settings. Firewall enables you to manage internet access for installed apps. 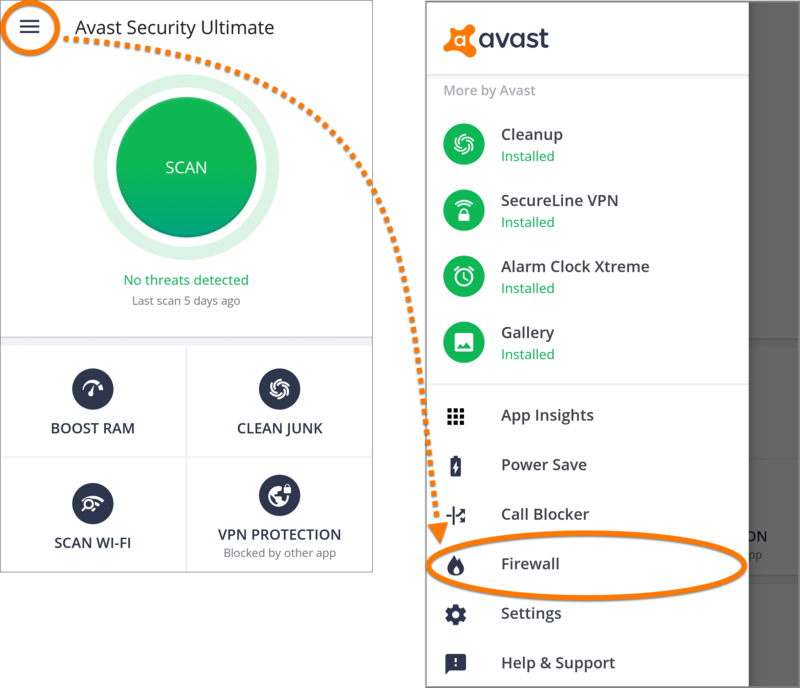 Avast Firewall only works on rooted devices. In case you are using ROM with a modified Linux core, ensure that iptables are supported. Alternatively, recompile the kernel with this feature supported. All the applied rules are logged when the user has enabled logging. The log is reset each time a rule change is applied. Tap ☰ Menu (three lines) ▸ Firewall. 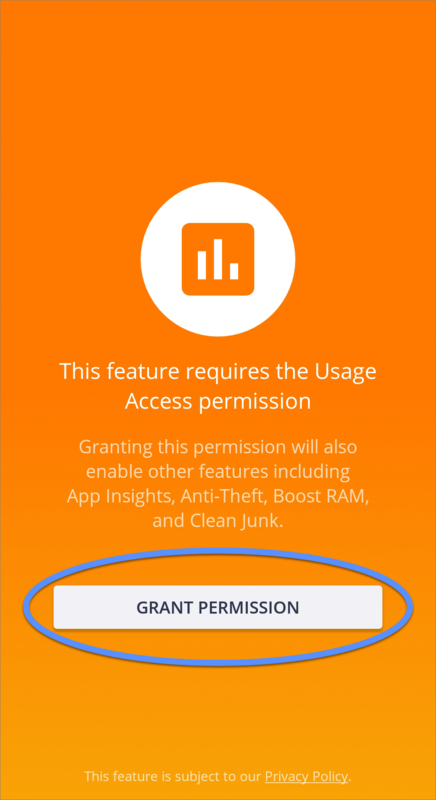 Tap the OFF slider so it changes to ON and tap Grant to give the feature access to your device. Block all: to completely block the app regardless of the connection type. Block mobile data: to block the app only when the device is not connected to a Wi-Fi network. On some devices, the Firewall may not work if the Android mobile data limit is enabled. To resolve this issue, tap Settings, and tap the slider next to Take highest priority so it changes to ON . 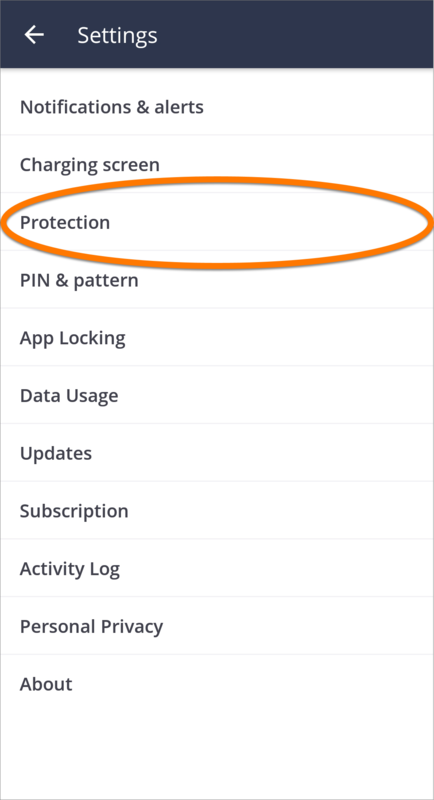 In the Settings section of the app, you can adjust the configuration of Avast Mobile Security to meet your needs. Tap ☰ Menu (three lines) and scroll to Settings. Notifications & Alerts: set the types of notifications that you want to receive from the app. All notifications are turned on by default. Permanent notification is necessary for the app to provide you with complete protection. Charging screen: help your device recharge faster by killing all background tasks. Protection: schedule automatic scans and turn on additional protection settings. Disable ads (Avast Mobile Security Pro only): remove the third party ads by upgrading your app to the Pro version. 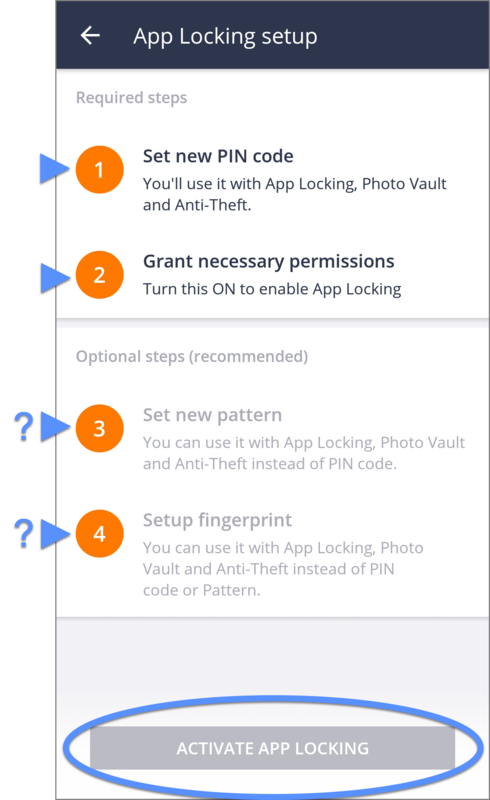 PIN & Pattern: set or change your App Locking PIN/Pattern. 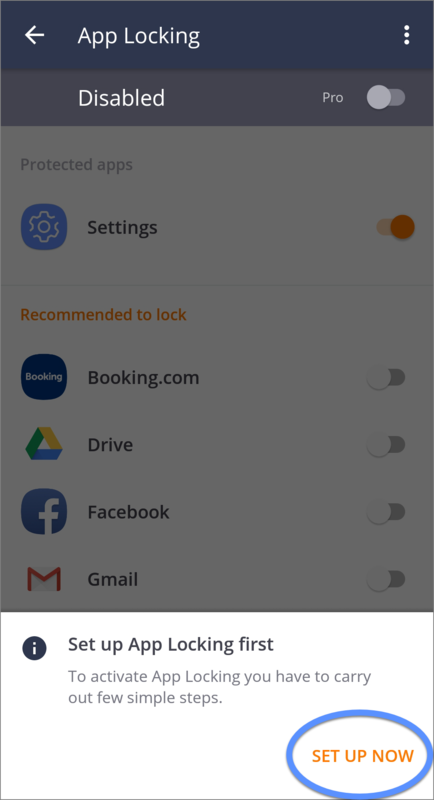 App Locking: specify when apps are locked with the App Locking feature. 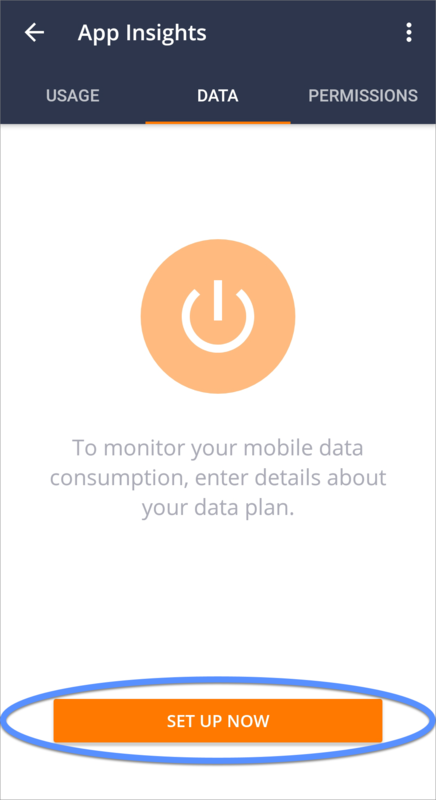 Data Usage: allow the app to manage your data usage by inputting information about your data plan. 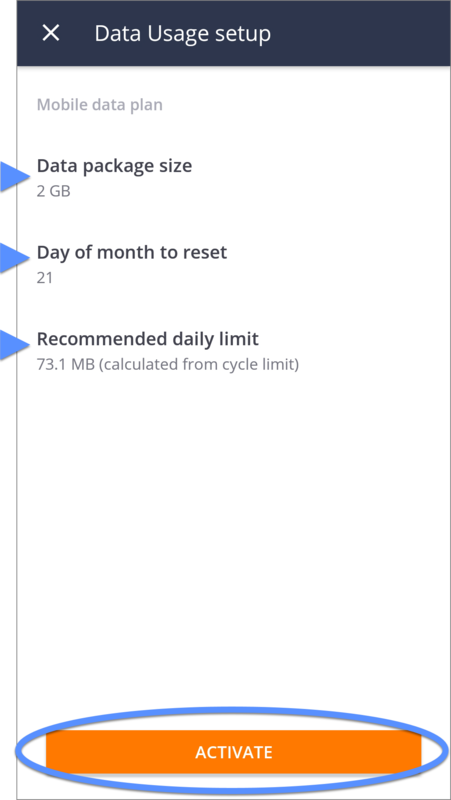 Based on this information, Avast Mobile Security calculates your Recommended daily limit. Updates: check the current Virus definitions version. By default, virus definitions are updated whenever you have internet access. To preserve mobile data, turn on the Update over Wi-Fi only option so that updates only occur when you are connected to a Wi-Fi network. Subscription (paid versions only): view your Activation Code and the date your subscription expires. Activity Log: view a list of recent activities performed by the app, such as updates and scans. 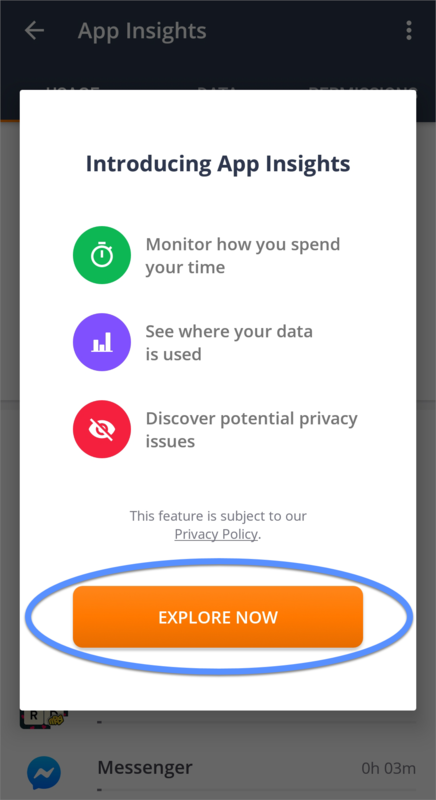 Personal Privacy: set your preferences for sharing anonymized information that helps us understand your needs and improve our product accordingly. About: view information about the app such as the End User License Agreement.